Dilled Matzo Ball Soup is warm, hearty, restorative, resonant with historical significance, and the essence of home and family. It can also beat the heck out of a cold or flu. It's one of the world's great comfort soups. First make the matzo balls. Beat the eggs and add in the oil. Mix in the matzoh and salt. Add the water and dill and mix thoroughly. Cover and refrigerate for about 30 minutes. Using a scoop or small spoon, make rounded balls out of the dough and set on a tray. I used a 1 1/4 inch scoop and got 21 balls. Bring lots of salted water to a boil and drop the matzoh balls in. Cover, lower the heat slightly, and let them simmer for about 15 minutes. Gently remove them to a plate. To make the soup, melt the butter in a soup pot and saute the onion and carrot for about 10 minutes. Add the celery and cook for another few minutes. Add in the stock, chicken meat, bay leaves and salt and pepper. Bring to a simmer and cook gently for about 15 minutes. Don't cook so long that the carrots become soft and mushy. 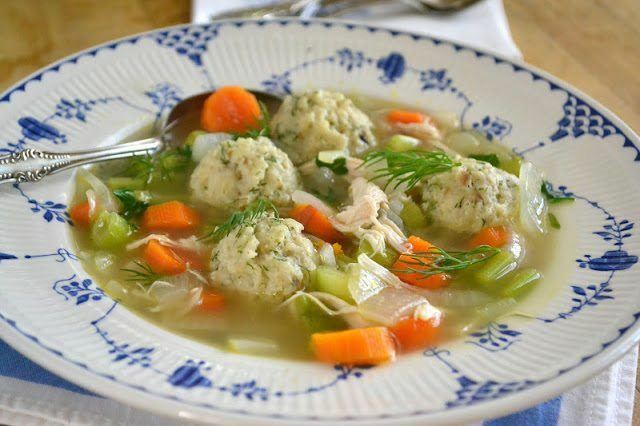 Just before serving, put the matzo balls into the soup and heat them through. Finish with a large handful of chopped fresh parsley and garnish with some dill leaves.